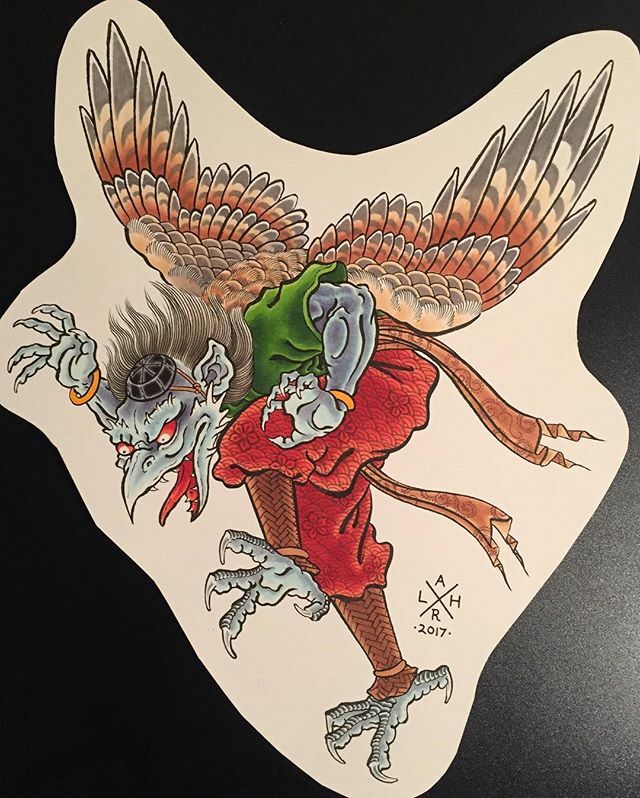 Tengu are mountain and forest dwelling humanoid yokai, often depicted with bird like features. This karasu tengu, or crow faced Tengu, is shown wearing cloths that borrow from the Yamabushi monks (a cast of ascetic, monks who follow the doctrine of Shugendō) who in turn worship the Tengu as protectors of mountains and forest. The image and idea of the Tengu has evolved over time. In the 12th and 13th centuries, accounts of Tengu describe them as vengeful spirits, often appearing as the ghosts of arrogant heretic priests. Later, the idea softened toward something more benevolent, hence the reputation as protectors of forests. In parallel, the image of the Tengu evolved from its more birdlike origins into something more humanoid, namely the Daitengu, or long-nosed tengu that are more prevalent in modern Japan.